← Tender Words of Our Lord to St. Mechtilde. Scrupulosity can be a great burden; I have experienced this first–hand. There was a time when I was terribly scrupulous; my spiritual life was dominated by minute examinations of conscience, endless self–reflection, fear, doubt, anxiety, discouragement, frustration and uneasiness. I did not possess peace, nor could I; for I was too preoccupied with my own desires, my own will. I may now say, with great gratitude to Almighty God, that I have found many powerful means for overcoming scruples. By God’s grace, I have been extricated from the web of scrupulosity. Of course, this does not mean that I am exempt from doubts and uncertainty etc. I say these things not to boast, but to encourage others. Scruples can be overcome! How? Please read on. I assure you that these remedies have worked for me. ** Keep in mind that this article will not be exhaustive; it would be impossible to explain every scrupulous doubt and state of mind. Rather, this article will provide several tips for overcoming scruples in general. Obey God; obey His Church; and obey your confessor. From disobedience springs chaos, unhappiness and spiritual blindness. One fruit of spiritual blindness, says a holy author, is the inability to distinguish between venial sin and mortal sin. Humility (i.e. “the sister of obedience” – revelation to St. Catherine of Siena) is necessary for salvation. Humility attracts an abundance of grace. We should ask God frequently for everything we need, including humility, knowing that He will infallibly grant us what is necessary to become holy. “Humility is truth” (St. Teresa, St. Padre Pio and others). The humble soul knows what they are and what God is. Consequently, they are ever at peace; trials are recognised as gifts of love from God’s Providence, which seeks only to purify us on earth so that we might avoid Purgatory and receive a greater reward in Heaven; imperfections are seen as occasions for humbling oneself; and the soul places all its confidence in God, Who desires that we entrust ourselves to Him like little children. To be humble is to obey God lovingly, calling to mind the truth that God’s will is the best possible thing for us; it is rely on Almighty God for everything; it is to believe that the only good we can ever hope to achieve or possess is a gift from God’s bounty. The term “abandonment” has many meanings in the spiritual life, but here it refers to abandoning one’s will (i.e. making of it a gift) to God, as well as one’s problems. If we are to overcome any vice, imperfection, or struggle, it is certain that we can do so only with God’s help. He loves it when we trust in Him; that way He receives the glory. Obedience, humility and abandonment: these three things will help us to conquer scrupulosity. What has been said so far is fairly general. The following pieces of advice are more specific. The scrupulous soul is inclined to excessive reflection and introspection. God does not demand this; He does not will it; it is useless! Consequently, it can never give us peace. What is the fruit of continually examining and analysing fleeting thoughts, imperfections, sins, spiritual advice, and a host of other things? Quite simply it is this: the mind grows weary; the will loses focus of its proper object (God); and the soul lacks the courage and strength to persevere. What is the remedy? For starters – and this should go without say – we should ask God humbly for the grace to trust in Him. We cannot care for ourselves. Without God, we can only damn ourselves. Without self–will, says St. Bernard, there would be no Hell! This is a profound truth. Ponder this truth often and you will grow in distrust of self as well as confidence in God. This is necessary for salvation, writes St. Alphonsus; and Our Lord confirmed to SG. Sr. Benigna Consolata that this is the key to sanctity! No one loves us more than God. Any love that we possess, including the desire that we have for our own salvation, is a gift from God! Surely, then, we should trust in God’s all-powerful love. God’s mercy is inexhaustible to those who repent with contrite hearts. A contrite heart is not necessarily one that feels great sorrow. Contrition is in the will; sorrow is merely an effect of contrition. As soon as the soul desires to turn from sin to God, she is pardoned, provided that love – not fear – is the mainspring. This is perfect contrition. It is not too difficult to attain if only we ask God regularly for this grace. He is more eager to grant it than we can ever be to desire it. Look at a crucifix and imagine that Our Lord were right before your eyes. Better yet, go to Mass, where Our Lord truly is right before your eyes (though only visible with the eyes of faith)! This is a powerful means for achieving true sorrow for our sins, which is always accompanied by a firm purpose of amendment. In other words, we must make a strong resolution to avoid all serious sin (at the very least) and the occasions of sin (e.g. movies with sexually explicit content). About 3/4 of following words were in the original post. Some further quotes etc., have been added. You might also like to read some other posts on this site, many of which are aimed at encouraging souls to trust in God. Posts tagged with ‘scruples’ or ‘scrupulosity’ might be particularly helpful. The merit for even a single act of faith is immeasurable! + Bad thoughts are only sinful if we consent to them. As St. Francis de Sales says: “Do not be disturbed about bad thoughts; it is one thing to have them and quite another to consent to them.” Our thoughts are not always free. Various thoughts enter our minds throughout the day; some that even enter our minds subconsciously, without us realising it. Furthermore, our brain forms connections (neural pathways) between certain thoughts or experiences; for example, if someone says the word “sponge”, I immediately think “bob.” I cannot control this, and if “bob” was hypothetically a sinful word, this would not be a sin because I do not will/desire the thought, nor would I let it disturb me. Why? Because that would only increase the thoughts and create a vicious cycle. There were saints, such as St. Faustina, St. Padre Pio, and St. Anthony Mary, who experienced severe blasphemous thoughts. Their remedy was abandonment to the will of God, and trust in His mercy. An excessive fear of offending God, particularly when we desire to please Him in all things, offends His tender goodness. Our Lord consoled Sr. Consolata Betrone by reminding her that He would not consider any thoughts that she had dwelled on involuntarily. Good-will comes from God. This extends to all good-will – even the atheist’s good-will. Without actual grace, we cannot so much as think a good thought (2 Cor. 3:5). We must not anticipate falls and sins. God knows that we are weak and imperfect; He asks only for our trust and fidelity. + Our consent or responsibility for sin is diminished by fear and anxiety: Fear and anxiety in particular have the tendency to cloud judgement, exacerbate unwanted thoughts and weaken the will. Fear multiplies the number and intensity of unwanted thoughts. We should ask God to remove this fear, and keep in mind that what we fear is a phantom; it cannot harm us. We must recognise that even the most hideous thoughts (if not consented to) are morally neutral; they are neither good (deserving of reward) nor bad (deserving of punishment), and should therefore be ignored. + “Anxiety is a temptation in itself and also the source from and by which other temptations come.” (St. Francis de Sales). Anxiety that results from distrust, as opposed to the feeling of anxiety, inevitably leads to other sins, because we must trust in God, without Whom we can do nothing. Avoid things that make you anxious, and reflect upon the mercies God has granted you. If He has pardoned us so many times when we were careless and sinful, we can be assured that He is more than willing to assist us when our desire is to love Him. Do not be proud and let past failures discourage us. Pray fervently for humility and trust, and don’t “combat” anxiety. We might think that our weaknesses cause us to fall into sin very easily. This is not so. This mistaken thinking might be the reason we become discouraged so easily. + Likewise, discouragement is a temptation in itself and also the source from and by which other temptations come. “Discouragement is the enemy of your perseverance. If you don’t fight against your discouragement, you will become pessimistic first and lukewarm afterwards. Be an optimist.” (St. Josémaria Escriva). “He (the devil) is overcome by unlimited confidence in Jesus; the more frequent the falls, the more should confidence grow in the divine Mercy” (Jesus to Sr. Benigna). 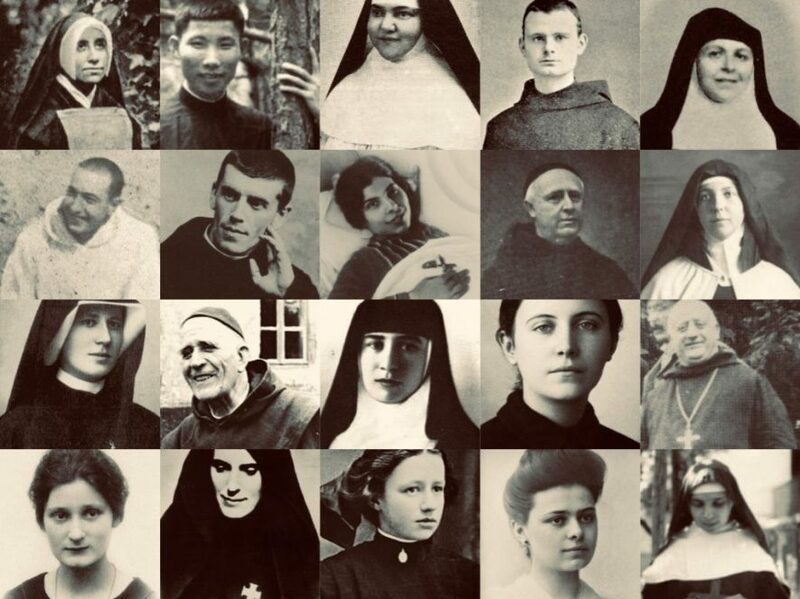 If we are so weak, we are most likely “little souls.” The doctrine of St. Therese on “little souls” (found in her biography and in the book, ‘My Sister, Saint Therese’) is most consoling. + Do not take an active approach to dispelling unwanted thoughts: It is quite useless, of course, to try and rid ourselves of these thoughts by thinking about them. Rather, the scrupulous person must recognise their habits, and proceed to go about their daily lives, regardless of the intrusiveness of their thoughts, which in time will lose their power. Our Lord has compassion for our weaknesses; we must therefore have full confidence in His grace, the advice of our confessor, and any other remedy that His Providence places before us. The book ‘The Doubting Disease’ (by Joseph Ciarrochi) is a helpful tool for recognising and overcoming obsessions and compulsions of all sorts. The author, however, is not a theologian. The author says that Jesus did not tell us what “the sin that will not be pardoned” is. That is true in some sense, but elsewhere in Scripture we are given to understand the context for this Scripture: God the Father draws us to His Son for pardon, and the Precious Blood of Jesus washes away all our sins “without exception”, as St. Ambrose says. Search ‘The SEEMINGLY unforgivable sin’ and you will be assured that God is willing to pardon every sin, but He cannot pardon those who are so blind and hardened that they neither recognise nor accept God’s mercy (which can always be accepted in this life). + Jesus Himself, though sinless, experienced the temptations and suggestions of Satan (Mark 1:13; Matthew 4:8). This should encouraged us, as the grace to conquer such temptations is made available to all by “the Lord thy healer”, the “Counsellor”, “The Prince of Peace” (Exodus 15:26; Isaiah 9:6).